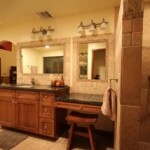 Bathroom remodeling Phoenix is a great way to improve your quality of life. Bathrooms are the place where we start each day and the place where we seek refuge at the end of our day. Wouldn’t it be nice to come home and enjoy a relaxing and rejuvenating bath in your new spa-like retreat at the end of a long day, or after a grueling workout session? Oftentimes we are so accustomed to the gradual aging of the bathroom, we don’t notice or know what to look for to indicate it is time for a bathroom remodel. So, we at Cook Remodeling put together this comprehensive list for you! Is your bathtub or bathroom sink chipped, dull, scratched, or worn? 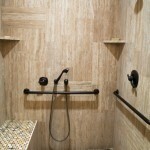 Do you have a problem or growth of mold in your grout? 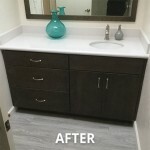 Do your bathroom cabinets lack the storage, look, and quality that you want? Cook Remodeling did such a super job for my previous home where they did a kitchen, a bathroom, and a room addition. In this house I did not hesitate to call them do a complete room addition. They are an excellent company. Cook Remodeling provided a very smooth remodeling project. They do quality work and the price is right.